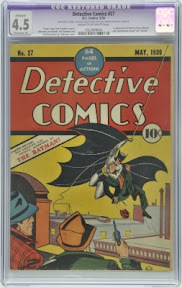 Multiple bidding in the room from their live internet feed and three transatlantic telephones led to some impressive results from the Dominic Winter/ Comic Book Auctions on Thursday night, including the headline sale of a copy of Detective Comics #27 for £28,200 - the comic in which 'Bat Man' (sic) debuted. Aside from Detective Comics #27, the big sellers were a restored copy of Superman #1 for £10,500 and Batman #1 for £9,600. A copy of Marvel's X-Men #1 sold for £3,877.00. Some other key results were Amazing Spider-Man #1 CGC 6.5 at £3,350; Amazing Spider-Man #14 CGC 9.2 at £2,700 and Amazing Spider-Man #25 CGC 9.4 at £1233. A copy of Avengers #1 CGC 7.5 sold for £4,112 and Avengers #2 CGC 8.5 at £1175. Even an issue Avengers #11 sold at a good price - £870. All prices include 17.5% buyer's premium. 'The sale was largely successful with all eyes on the Detective #27 at an impressive £28,200 including 17.5% buyer's premium," notes Comic Book Auction's Malcolm Phillips. "The Avengers did particularly well in advance of the upcoming movie, as did the ever-popular webslinger and Professor X's Militant Mutants. Superman #1 and Batman #1 were both CGC restored copies, just meeting their reserves. "Given this was our our debut live auction of a one-owner collection of 2,500 US comics, the biggest inventory ever offered outside the USA, both ourselves and the vendor were absolutely delighted with the overall results." 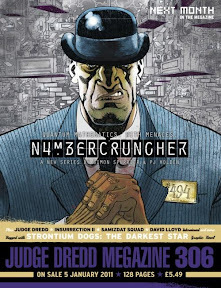 A quick Friday plug for Numbercruncher which starts in the New Year in the Judge Dredd Megazine. Created by Si Spurrier and PJ Holden, it's a creator owned series and we reckon that it deserves support since it is, for publishers Rebellion, a bit of an experiment. PJ Holden tells us Numbercruncher will be 8 page chunks and will run for 10 episodes, along with the usual "bunch of cool stuff" in the Meg. Here’s the cover fr the opening episode (logo designed in house by Simon Parr). You can buy the Megazine in all good newsagents and, if you’re in the US or elsewhere, you should be able to buy the Meg online at Clickwheel (www.clickwheel.net/features/229) and the 2000AD online shop. Hope Street Studios in Glasgow are looking for any illustration students interested in a paid internship, who would mainly be doing comic book work but possible storyboarding and design. Top artist Gary Erskine, who is heading up the hunt, tells downthetubes they're looking for someone from Glasgow and Edinburgh (or within nearby area) as some work involves being on hand at the studio. Sequential art experience is preferred but not essential. To apply, please send a link to your Deviant Art site or similar and provide a contact email address. • Email Gary at garyerskineonlineATbtinternet.com He will follow up with interested parties as soon as possible. The first issue of the academic SANE journal: (which stands for Sequential Art narrative in Education) is out now, with its first issue focusing on "comics in the contact zone." SANE publishes research- and practioner-based articles covering all intersections of comics and education, from pre-kindergarten to post-secondary studies, from a variety of disciplines. Articles in this first issue include articles examining how graphica engages what Mary Louis Pratt has called the 'contact zone' - social spaces in education and life where entities meet, clash and grapple with various conflicts and constructions. 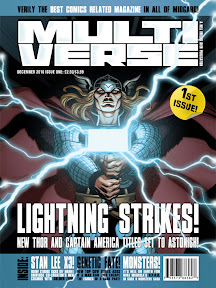 Articles may include the amusingly titled 'Everything I Learned About Teaching in the Contact Zone I Learned from Charles Xavier and the Uncanny X-Men' and 'This is Not Your Forefather's Thor: Using Comics to Make Mythology Meaningful' but they're meant as serious study of the medium and its uses. The second issue will focus on teaching the works of Alan Moore, and the editors are still accepting submissions for it. • Visit www.sanejournal.net to read articles, a review, rationales, and more. Interested in bande dessinee? Then perhaps you should consider membership of the International Bande Dessinée Society and get hold of copies of the journal European Comic Art. The IBDS is a forum for scholarly exchange on all aspects of the bande dessinée, or French-language comic strip. It welcomes all critical approaches, be they historical, sociological, political, literary, linguistic or other. Founded in 2001, the Society largely, but not exclusively, draws its membership from English-speaking countries, thereby offering an alternative viewpoint to that of the thriving French-language BD community. 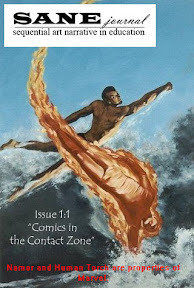 In 2011, members of the IBDS will again receive the journal European Comic Art as part of a special membership package. Published by Liverpool University Press twice a year, European Comic Art, hosted online by Metapress, was the first English-language scholarly publication devoted to the study of European-language graphic novels, comic strips, comic books and caricature. In a packed final show on radio show Panel Borders for 2010, Alex Fitch concludes his look at anthropomorphic comics, with a survey of recent titles for all ages – Gary Northfield’s ‘Derek the Sheep’ who appears in The Beano and Beano Max comics; Mouse Guard, a series of adventure comics and graphic novels by David Petersen; and ‘Comical Animal’, a new website devoted to funny animal strips, curated by Jim Medway. The show features interviews with all three creators, recorded variously in Streatham Library, near Euston Station and via transatlantic phone line! One of the upcoming titles from Markosia thrust into my eager paws over the past couple of months was The Indifference Engine, written by Cy Dethan (writer of Cancertown) with pencils by Robert Carey. It's a great timeline-spanning four-part mini-series, centring on one Alan Blake, a distinctly ordinary 20-something suburban slacker responding to a strange job advertisement who finds himself in the middle of an inter-dimensional task force staffed entirely by superhuman alternate versions of himself. Struggling to fit in, he uncovers a conspiracy that strikes at the very heart of the organisation – a conspiracy that only he can stop. There's some good news for people intirgued by this premise, because the book has been bumped up Markosia Publications’ release schedule and has made its way to the Playstation Network Comic Store just in time for Christmas. You might recall I enthused about this book a while back, and now you can find out about the title for yourselves, which should make Rob Carey very happy as this his first full length graphic novel. Meanwhile, over on the PSN blog, Pauline Martyn, the Publishing Manager at PSN Digital Comics posted: “Cancertown was one of the highlights of our early offerings – a great series which steadily grew a loyal cult following during its time on the store." “You’re going to be freaked out," enthuses publisher Harry Markos of the book. "I warned you, a while ago, that The Indifference Engine would blow your minds. Well, as promised, issue one is here to do just that..."
• Read a free preview of the first 14 pages over on the website along with a sneak peak at art from later episodes. • For those who don't have a PSP, look out for other formats next year - and there is already a sequel in the works! • More 2010 eCards from creators I've worked with or plugged on downthetubes here on Flickr, including work by SMS, Sion Mackie, Paul McCaffrey and others. Mirabilis: Year of Wonders, a graphic novel by Dave Morris and Leo Hartas first seen in The DFC comic launched in the App Store for iPad this week. Mirabilis is a fantasy adventure story for young adults which opens New Year’s Day 1901, when a green comet appears in the sky. As it gets bigger, the line between reality and fantasy blurs. 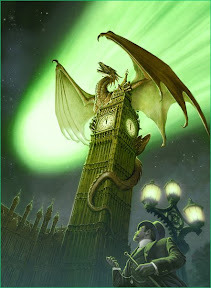 Soon there are mermaids in the Thames, elves in Parliament and a dragon roosting on Big Ben. But then the comet rounds the sun and starts to fade. Will the world be able to go back to a life without magic? 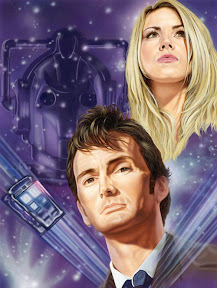 The full-colour graphic novel was originally serialized in The DFC, the weekly print comic published by Random House UK, who financed the production. Mirabilis is the first of the DFC strips (which include Mezolith, Mo-Bot High and Monkey Nuts) to appear on iPad. The iPad app comprises the first 200-page season in what Morris and Hartas plan as a four-book epic. “As soon as we saw the iPad we knew we had to release Mirabilis on this platform first," adds Leo Hartas, the story’s co-creator and illustrator. "The quality is better than print. The colours have to be seen to be believed." Despite their obvious (and deserved) enthusiasm for the iPad, Dave and Leo aren't leaving print behind. Hardcover volumes of the Winter story will be published by Print Media Productions next year, and serialized print editions are in negotiation for India and the United States. Here's the first official artwork from the Etherington Brothers brand new series, YORE!, which will be making its early 2011 debut very, very soon in The Dandy. This is just the latest of several strips the Etheringtons, creators of Malcolm Magic, Tusk, MOON and Baggage have brought to British comics fans, which include Monkey Nuts, recently released as a collection by Random House, and the web comic Lore of the Things. "We don't want to give too much away (hence the completely non-explanatory pic choice! )," say the boys, "but we can reveal that there will be action, adventure, laughs, lots of complaining about stuff, gratuitous cartoon violence by the bone-filled bucketload, er, and a pig." So remember folks, when you're sitting there at home on Christmas Eve feeling jaded because there's nothing on the TV but a rerun of Dr No or Jamie Oliver cooking something ... just remember ... Santa really does exist ... and he'll be bringing you a special gift every single week of the year in technicolour quest-o-vision! I first worked with Andrew Skilleter when I was editing Doctor Who Magazine in the late 1980s and I admire his work tremendously. He's a dab hand at both original and licensed art commissions, particularly Doctor Who (for which he's best known) - and some of his Dan Dare pieces, inspired by the Eagle comic character, are tremendous fun. Anyway, after much planning and labour and little help from his friends, his new website is now live, including extensive galleries, bigger and better images, a blog and shop with online secure checkout if you want to buy any of his prints, such as his Narnia range. As well as Doctor Who, Andrew has worked in numerous genres and you'll find a kaleidoscope of multi-genre images on this new site. After being marooned at its Scottish printer for well over a fortnight – just one more victim of the worst snow the country has seen in 40 years – Multiverse #1, the first issue of Britian's new British comic magazine, is finally on its way to the shops. “There is something more than a little ironic about the launch issue of title from a company calling itself Hell Freezes Over being delayed by freak winter weather conditions but that’s exactly what happened,” explained publisher/editor Mike Conroy, who's hoping the new title will fill the void left by the demise of Comics International. “The very day Multiverse #1 was due to leave our printer the snow started falling and the temperature plummeted right along with it. It wasn’t until last Wednesday, 8th December, that the trucks could actually get in to Bonnyrigg to collect the print run. “Copies are now reaching the shops but I’m advised that the backlog is so large that it could still take a week or more for orders to get to every outlet,” Conroy added. “The difficult circumstances have led me to scrap my plans to have a second issue out before Christmas. We’re now reworking the pages already produced for #2 and aiming to have it in the shops in early January... weather permitting, of course!" “On behalf of the Multiverse team, I would like to thank all those who have sent messages of support and encouragement during what has been an extremely frustrating start to this new venture,” Mike concluded. It's clear Mike feels the problems he's faced keenly, especially given his association with Comics International, whose frequency suffered for a number of reasons towards its end. 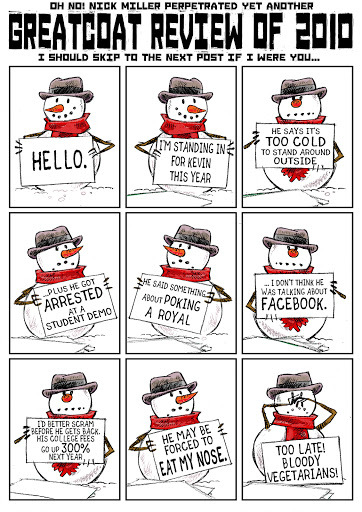 He must be feeling the fates are conspiring - let's hope they give up and move on in 2011. The latest issue of Eagle Times for Winter 2010 is on available now and has the usual intriguing mix of Eagle comic-related goodies to offer, including a profile of the artist Brian Lewis, whose work included strips for Eagle, 2000AD, Countdown and House of Hammer. • Visual memories of the 37th World Science Fiction Convention, Seacon '79, which was held in Brighton in 1979 - with guests who included Frank Hampson and Arthur C Clarke. For a full list of contents, visit the Eagle Times blog. The issue also includes a review of Dan Dare - The Biography by Daniel Tatarsky and the Eagle Annuals between 1961 and 1971, published after the takeover of Hulton Press. 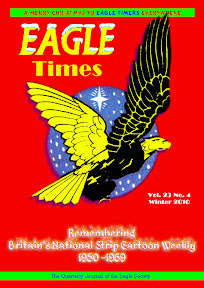 • Membership of The Eagle Society is via Annual Subscription to Eagle Times magazine, which is published four times annually. The Subscription rate for 2011 is held at the 2010 rate (UK £23, Overseas £34 - payment in £s Sterling, please). 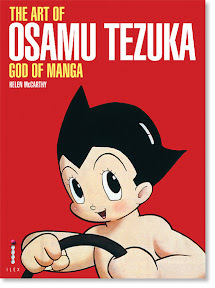 UK publisher Ilex’s bestselling The Art of Osamu Tezuka: God of Manga has been announced as the winner of the 2010 Harvey Award for ‘Best American Edition of Foreign Material’, and was also recently shortlisted for the prestigious Eisner Award. Written by Helen McCarthy, the book is the first authorised English language biography on Japan’s most celebrated artist of the 21st century and I think it will interest followers of this blog. I also worked with Helen on Manga Max magazine a few years back. Osamu Tezuka has often been called the Walt Disney of Japan, but he was far more than that. Tezuka was Disney, Stan Lee, Jack Kirby, Tim Burton and Carl Sagan, all rolled into one incredibly prolific package, and he changed the face of Japanese culture forever. This book reveals what makes him one of the key figures of 20th century pop culture. Packed with stunning images, many never before seen outside Japan, it pays tribute to the work of an artist, writer, animator, doctor, entrepreneur and traveller whose insatiably curious mind created two companies, dozens of animated films and series, and over 150,000 pages of comic art in one astonishingly creative lifetime. ILEX call The Art of Osamu Tezuka: God of Manga "an amazing adventure for the manga and anime neophyte, an essential reference for the confirmed fans, and a visual treat for anyone who loves art". 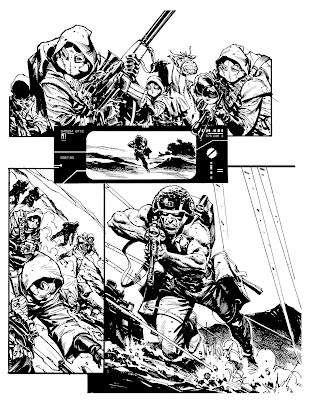 Art from the new Rogue Trooper story for Prog 2011 by Staz Johnson. 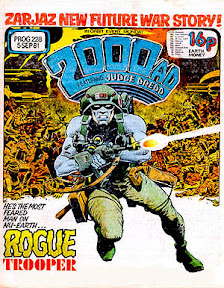 Rogue Trooper is one of science fiction comic 2000AD's most iconic characters. A deserter in a future war, he roams the barren surface of Nu Earth, a chemical ruin of a planet, on a sworn mission to avenge his dead comrades from the Quartz Zone Massacre. He's accompanied on this mission by three fallen buddies, in the form of biochips imprinted with their personalities after their deaths. Now Rogue is returning once more to 2000AD and, for the first time since 1985, original series co-creator Gerry Finley-Day is writing the strip. Matt Badham: Gerry, what have you been up to writing-wise since you stopped working for 2000AD? Gerry Finley-Day: Once a writer, always a writer… I have written novels and some screen plays. Matt Badham: And what brought you back to 2000AD and to Rogue? Gerry Finley-Day: When my friend Pat Mills returned from a comics convention in the States he told me that many people were asking about me. He seemed to think there was a demand for some fresh material from me and I thought, why not? Matt Smith: Pat got in touch and said that he'd like to work (in an editorial capacity) with Gerry on a Rogue story. I think he felt that Gerry got unfairly sidelined out of 2000AD, and wanted to help him try to write something for the comic today. The plan was to work on a standalone Rogue tale, something that could slot quite easily into the comic. first appearance back in 2000AD Prog 228. Pat Mills: Gerry was the creator of Tammy, from which Battle, Action and 2000AD are descended, so he is the founder of modern British comics. This has been pretty much ignored by comic historians and Gerry also had some insider-encouraged negative press on the web in years gone by, which made me seethe with anger with its inaccuracy and self-serving motivation. The reality is fans loved his work, but it didn't find favour with 2000AD editorial at one stage. Having been Gerry's editor, I know the relatively small problems they faced (pacing and some story logic issues) but it was my view that it was worth dealing with them 'in house' because his stories were so popular. We all of us have our scripting faults and eccentricities and it's just something I felt we had to accept. Editorial didn't agree and I can completely understand why. But fans didn't agree with them either and kept asking for Gerry back, so I recently seized the chance and facilitated it. Matt Badham: Matt, where in Rogue continuity is the story set? Matt Smith: During the original run. It starts with the commemoration of the fifth anniversary of the Quartz Zone Massacre. Matt Badham: How did you go about finding an appropriate artist for this new episode and why did you choose Staz Johnson? Matt Smith: It was always the intention to run it in black and white, so I was after a good b/w artist. Staz has experience drawing Rogue and was champing at the bit to do it. Matt Badham: How excited were you to welcome Rogue and his creator back? Were you a fan of the strip way back in the day...? Matt Smith: It's good to see the original Rogue back in the prog for a simple, action-packed story. I was a fan of the original run, but he's a character who's been diminished, unfortunately, by too many 're-imaginings' and new directions. Just seeing Rogue back on Nu Earth fighting Norts is quite reassuring. 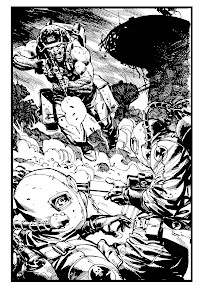 Art from the new Rogue Trooper story by Staz Johnson. Matt Badham: Staz, are you also a fan of Rogue from way back? Staz Johnson: Absolutely I am. I was at the key 2000AD readership age (17) when Rogue debuted in 2000AD and it didn't take long before he had usurped Dredd as my favourite character. Anyone who has followed my blog will have seen this post where I posted some of my attempts at Rogue from long before I became a professional cartoonist, and just drew him for the sheer love of the character. Matt Badham: So, how did you actually get involved with the new strip? Staz Johnson: There was no alchemy to it, as it was simply the case that I had spoken to Tharg saying I was available. (I assume) when the script came in a few days later, he in his mighty wisdom figured I'd be a good fit, so he called me up. Matt Badham: Pat, what was the exact nature of your 'editorial' involvement with the new strip? Pat Mills: I made a few minor changes to Gerry's new Rogue story strip, but frankly it was just like I remembered his scripts. Not a big deal to make a few alterations. He has a feeling for some stories - notably war - which the readers intuitively respond to because of his own military background in the Territorial Army. Matt Badham: Matt, are we going to see more Rogue from Gerry? Matt Smith: I think Gerry would be keen to write more, providing it goes down well. It would have to be an occasional thing, a retro blast now and then, as I feel, as a series, the story's been played out. 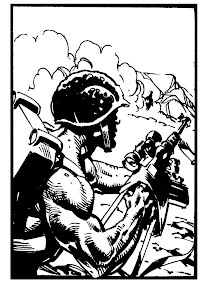 Matt Badham: Gerry, do you think you'll return to Rogue again after this outing or maybe even pen further instalments of some of your other strips, such as The V.C.s or Fiends on the Eastern Front? Gerry Finley-Day: I hope so, [but] that will be up to Matt [Smith]. Matt Badham: How easy was it to slip back into writing for the character and his world? Gerry Finley-Day: As I said, I haven't stopped writing and Rogue is a good character. Matt Badham: Did you enjoy the experience? Gerry Finley-Day: Yes, very much so. Matt Badham: Why do you think that Rogue has remained a fan favourite among 2000AD readers? What is the character's core appeal? 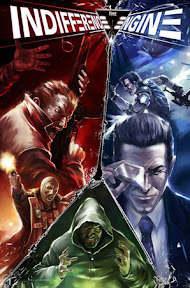 Gerry Finley-Day: I suppose because war - like it or not - is the ultimate adventure and Rogue is still the recognisable soldier no matter how far into the future. Matt Badham: Pat, you facilitated Gerry's return so presumably you want to see him write more for 2000AD? Pat Mills: Reader reaction to Gerry's impending return has been extremely enthusiastic and I'm hoping I can persuade him to write more. We really don't want anyone else writing Fiends, V.C.s or Rogue, any more than fans would appreciate anyone other than Alan Moore writing D.R. and Quinch or Halo Jones. Gerry is entitled to the same respect. Matt Badham: Staz, Would you like to do more Rogue? Staz Johnson: I'd love to. I'd certainly hope that should Tharg choose to run more Nu Earth stories, I'd then be given the opportunity to draw at least some of them. I suppose the question is whether there is a thirst among the current 2000AD readership for a strip that is essentially 'retro'. There's no point making strips just because the creators think it's fun to work on them. I think there's still a way to make war stories relevant to a modern, more sophisticated audience, without having to resort to gimmicks or by making a war story that isn't really about war. Take a look at Saving Private Ryan and Band of Brothers. A Rogue with that level of visceral realism, gravity and pathos would be fantastic I think. Matt Badham: What was it like working on a 'classic' strip with a 'classic' creator? Staz Johnson: Well, that was the thing. As a fan of those original Nu Earth stories, it was a real thrill. Clearly, as the original writer, you can take as gospel that this IS Rogue… not just another writer's 'version' of the character. Matt Badham: What approach have you taken to the visuals for this new episode of Rogue? Staz Johnson: Well, one of the things that pulled me into Rogue way back in 1981 was Dave Gibbons' artwork. 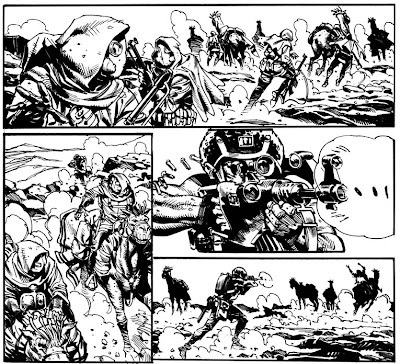 I had my old Titan Books reprint of the Gibbons strips on my desk the whole time I was working on the pages, so I took a lot of my design cues from him: things like the Southerner military police and the genetic camels, stammels. 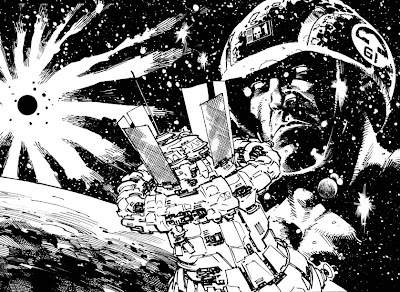 However, in addition to that, I looked at a lot of other old school 2000AD artwork because I definitely wanted it to have that 'feel'. In the end I think it wound up being close to someone like [Mean Arena artist] Mike White's work, with bits of Jesus Redondo thrown in. Hopefully with a healthy dose of Staz Johnson too, obviously. 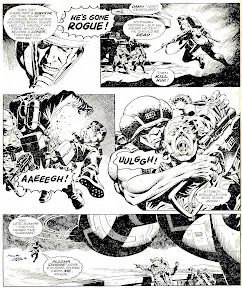 Matt Badham: Who is your favourite Rogue Trooper artist? Staz Johnson: Dave Gibbons, all the way. That's not to denigrate those who followed him, especially Cam Kennedy, but for me Dave is #1. Matt Badham: Matt, Gerry isn't the only creator to have made his way back to 2000AD. You've also had Brendan McCarthy back in the mix. Why do you think these 'classic' creators are being tempted back to 2000AD? Matt Smith: Partly because it's always there. If you've got a gap in your schedule, it's worth tapping up 2000AD for a short Dredd story or whatever. Also, because it's fun - no hoops to jump through, no marketing men to approve every process, just get back to having fun with comics. And 2000AD characters hold a special place in a lot of creators' hearts - they've been with them for the past three decades. Matt Badham: Are there any other ex-2000AD creators you're particularly keen to welcome back into the fold? 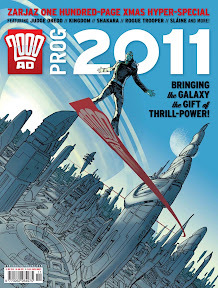 Matt Badham: What else is in Prog 2011 and why is it a good jumping on point for new readers? Matt Smith: We've got a 12-page complete Dredd story by Al Ewing and Paul Marshall, called 'The Chief Judge's Speech'; the ten-page opening episodes of the post-apocalyptic Kingdom: 'His Master's Voice' by Dan Abnett and Richard Elson, pan-galactic weirdfest Shakara: 'Avenger' by Robbie Morrison and Henry Flint, supernatural thriller Ampney Crucis Investigates: 'The List of Ten' by Ian Edginton and Simon Davis, and Hell-set Necrophim: 'Civil Warlord' by Tony Lee and Lee Carter; 12 pages of Celtic barbarity in Slaine by Pat Mills and Clint Langley; and a one-off Psi-Judge Anderson story showing her as a cadet, by Alan Grant and Patrick Goddard. If a new reader picks that little lot up, you'll get a good idea of what 2000AD is about - action, SF, horror, oddball characters and wild ideas, brilliantly written and wonderfully drawn. If you want a comic like nothing else out there, get into 2000AD! • Thanks to Matt Badham for organising this round table. And thanks to Matt Smith, Gerry, Pat and Staz for participating.